From Braka (or Manang, just up the road), hikers can choose to go north towards Churi Ledar and Thorong-La Pass OR they can decide to tack on a side-trek west to Tilicho Lake. Tilicho Lake is the world's highest lake, settled into a glacier-carved basin at 5000 meters above sea level (~17,000 feet). 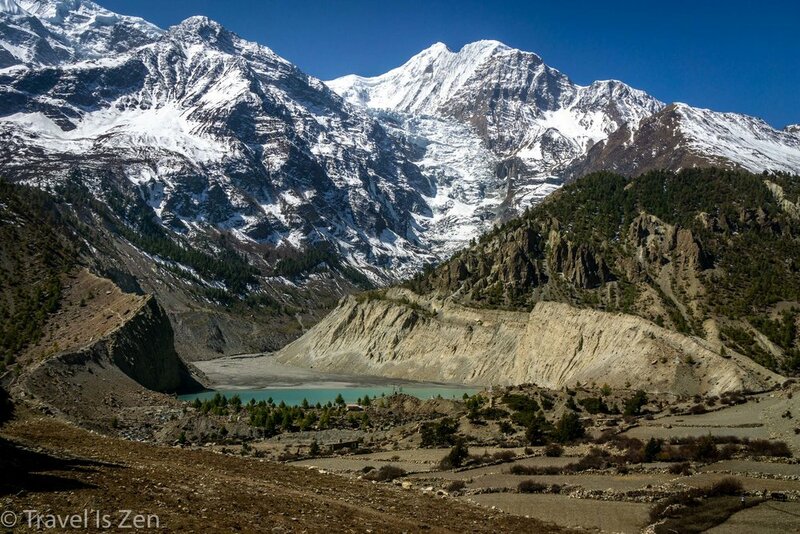 The trek to the lake requires a couple of nights acclimatization and therefore adds at least 4 extra days to the traditional Annapurna Circuit route. Following Andrees de Ruiter's suggestion to "Pimp our Annapurna Circuit" with a side trek to Tilicho Lake. Yesterday afternoon, we sat on the warm, sunny porch of New Yak Hotel in Braka, eating a soft sweet cinnamon bun. This morning, we headed west, following the blue-and-white trail signs pointing the way to Tilicho Lake. The 7 mile hike out of Braka was fairly easy until the aggressive thrust from Khangsar up to Shree Kharka. We climbed around 1500 meters on a 45 degree+ slope, most of it in the last mile or two. At over 13,000 feet in elevation, our hearts were pounding. This is where the "Himalayan shuffle" comes in handy to conserve energy. Rather than taking full strides, half step by placing your front heel just at the insole of your back foot. Slow and steady. We learned this technique by watching the locals. ;-) We stayed the night in Shree Kharka at 4075 meters. The following day, the short 4-mile stretch to Tilicho Base Camp ushered in a whole new landscape and fear factor. We had to cross an active landslide area. This landslide zone is no joke. It is a dangerous two mile stretch. The trail is very narrow and when the loose gravel thaws in the afternoon, the trail slides downward beneath your feet. At one point, we were literally running to keep from sliding. Above the trail, tiny avalanches of pebbles and sand crossing the trail were a reminder that the slope could give way at any time. We kept a close watch on the larger boulders above us as we hurried across. It was intense! Just a few hours after arriving at Tilicho Base Camp (4200m), the clouds overtook the sun and unleashed a snowstorm that lasted through the night. Gathered in the dining area that evening, watching the snow fall and listening to the thunder, we learned that just a handful of people actually made it to the lake today. They said it was frozen over and covered in snow, so it just looked like a white snowy depression. Most others turned back due to the unexpected deep snow drifts and pending storm. We went to sleep with tempered expectations.